Size: Portrait 29 x 23 cm Landscape 23 x 29 cm. Contains 20 photo pages which are available in either black or cream, and 20 silk sheets which are available in a variety of colours (see silk sheet papers). Choose the colour of your album from the handmade range of papers. 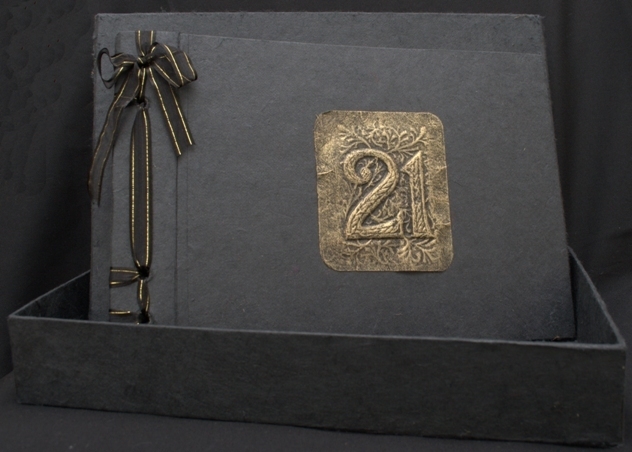 21st mould can be replaced with other milestone birthdays and you can choose between gold, silver or bronze colouring. Choose a ribbon in the colour of your choice (see ribbons) for the spine. A matching plain storage box is included.